As we head into Week 7, it’s time again for our weekly look at the fantasy football players on the rise or fall in the weekly rankings. Each week before you can turn the page to your next fantasy matchup you need to do a final assessment of your learnings and how they impact the value of players. It will set the stage for you in hitting the waiver wire, setting your lineups and maybe even hitting the trade block. In this weekly feature we will dive into the numbers and look at some of the players who are moving up and some that are moving down we start the process of determining next week’s rankings based on their performance turned in during the week we just wrapped up. Winston didn’t disappoint in his first start of the season for the Bucs as he delivered in a prime matchup with the Falcons. He threw for 395 yards and four TD passes on 30-of-41 passing and added 31 rushing yards on five carries. … It took time before looking completely healthy, but Wentz definitely passed the eye ball test in Week 6 against the Giants. He completed 72.2% of his passes and has thrown for multiple scores and gone without an interception in three straight outings. … Volume continues to help Luck’s fantasy value soar. Over the last three games including Week 6’s effort, Luck is the top-scoring fantasy quarterback with 11 touchdowns passes and 1,130 passing yards during that span. … Trubisky came up on the losing side of the ledger at Miami, but he delivered another solid fantasy effort. His 316/3/1 stat line and 0.78 fantasy points per drop back helped many of his fantasy owners to victory. … A week after he appeared in the “fallers” section of this column, Prescott returned to the fantasy radar in Week 6 against the Jaguars. He finished inside the top 10 at the position for the first time since Week 14 of 2017 with 30 fantasy points in Sunday’s win. For the second straight game, Cohen delivered fantasy goodness. Only Melvin Gordon and Kareem Hunt posted more PPR fantasy points per opportunity (0.92). He pulled in seven of nine targets for 90 yards and carried the ball five times for 31 yards in a touchdown. 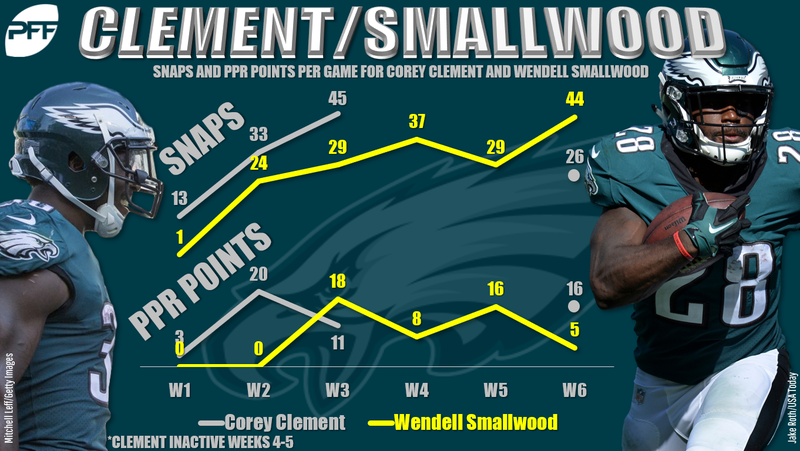 … With Jay Ajayi out for the season with an ACL injury both Clement and Smallwood have stepped into roles that offer fantasy production. Smallwood (19) had more touches Clement (14) in the win over the Giants, but Clement delivered a better stat line. … Barkley was already high across our PFF rankings, but after his Week 6 effort in which he netted 38 PPR points he is safely in Tier 1 and a top-three fantasy running back the rest of the way … Mack had a career-high 93 total yards on 13 touches in his return after a three-week absence due to a hamstring injury. He’s back on the flex radar heading toward his Week 7 matchup with Buffalo. Philadelphia’s offense is starting to get healthy and click, and Jeffery has played a role in that. He pulled in two touchdowns and finished with eight catches and 74 yards. Since his return, the Eagles’ wideout has scored the eighth-most standard fantasy points at the position. … Thielen continued his stellar season with a sixth straight 100-yard game, becoming just the second player in NFL history to accomplish that feat to start the season. After pulling in 11 balls he now has a record 58 receptions through six weeks. … The Colts continue to Rogers a ton of targets with injuries piling up on offense. Only Julio Jones and Thielen have seen more targets than Rogers (32) over the last three weeks … After disappearing in the team’s loss at Chicago before the bye, Godwin caught six of his nine targets for 56 yards and a touchdown versus the Falcons. He’s now found the end zone in four of his five games in 2018. … After being passed over last week on the waiver wire by many, Moore scored for the second straight week and finished with 47 yards. However, he has only been targeted seven times in two games, so he cannot be trusted in lineups just yet. The Falcons are feeding Hooper the football. Over each of the past two games the tight end has seen double-digit targets. In that time, he’s caught 18 balls for 145 yards and a touchdown. … Njoku found the end zone for the first time all season in Week 6. He ranks fifth on the season in targets (41) among tight ends, including being targeted 10 times against the Chargers. … The Panthers welcomed Olsen back after he went down with Week 1 foot injury. He played 59 snaps and was targeted seven times on 36 routes ran, finishing with four catches for 48 yards. It was a disappointing week for Watson as he only threw for 177 yards and a touchdown. The bigger concern was that he only carried the ball twice for two yards after sustaining rib and lung injuries in crushing hits a week earlier versus the Cowboys. … Bortles had his worst start of the season as the Jaguars took a 40-7 beating in Dallas. He only amassed 149 passing yards with one TD. He has now thrown for one or fewer touchdowns in four of his six starts. … Tennessee was dominated by the Baltimore defense. Mariota was sacked more times (11) than he had completions (10). He cannot be trusted in fantasy lineups. … The stats weren’t great for Manning in Week 6’s loss to the Eagles, but it looked even worse. He went without a passing touchdown for the second time this season and has now only eclipsed 20 fantasy points in twice in six games. Fantasy owners are growing impatient with Howard and rightfully so. 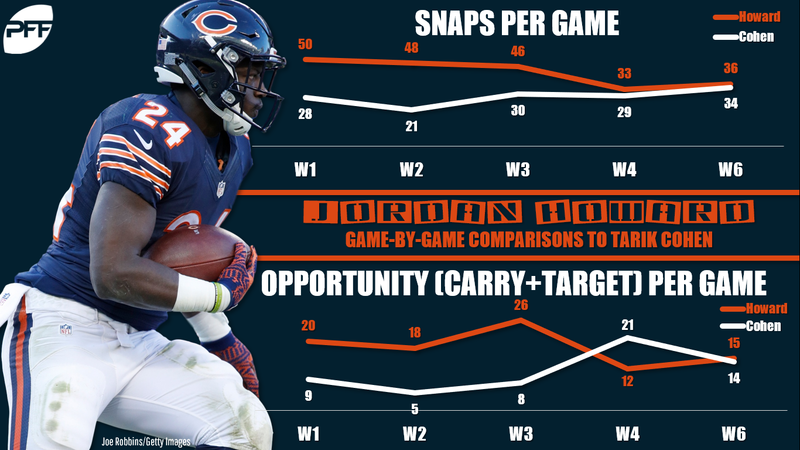 Howard has turned in back-to-back brutal performances and despite dominating the early-down work for the Bears it hasn’t led to fantasy production. Howard is RB36 in PPR leagues through six weeks and he has just one touchdown on the season. … Hyde is a volume-based, TD-dependent fantasy running back. Game flow hurt him this week as he had a season-low 14 carries and failed to score for the second straight week. It also marked the third contest this year in which he averaged less three yards per carry. … It was a disappointing effort for Freeman in Week 6. The rookie’s draft stock soared during the final couple weeks of the preseason, but so far this season he’s finished weeks as RB44, RB35, RB26, RB24, RB38, and RB51. … Tennessee teammates Lewis and Henry continue to be major fantasy disappointments. Lewis rushed for nine yards on five carries and only caught two balls for five years. He has caught three or fewer passes in four of last five outings. Henry only has four receptions all season and has yet to hit 60 yards rushing or score a touchdown through six weeks of action. For the second straight week, Fuller turned in a quiet performance for the Texans. He was only targeted three times and finished with two catches for 33 yards. After nine straight games of scoring a TD when playing with Deshaun Watson, Fuller has now gone two straight without hitting paydirt. … Evans was a huge disappointment matched up against a banged-up Falcons’ secondary in Week 6. After a solid opening month, Evans has 10 catches for 117 yards and no touchdowns over his last two outings. … Despite playing in one of the league’s most prolific passing attacks it is hard to endorse Watkins as a trustable lineup option. Week 6 provided another example of his mediocrity as he finished with only a pair of receptions. He now has totaled eight catches over his last three contests. … The buzz is dying down on Stills. After the Dolphins’ wideout scored three times in the first three games of the year, he’s now gone three weeks without a touchdown and has only gone over 60 receiving yards once in his last five outings, including finishing Week 6 with just one catch for 35 yards. Cook is starting to come back down to reality after a hot start. He finished Week 6 with two catches on 10 yards and has now failed to reach nine PPR points in four of his six games this season. … Reed has been able to stay healthy, but it hasn’t led to him being a huge fantasy producer. He hasn’t scored since Week 1 and his best receiving output of the year was the 65 yards he tallied in Week 3. … Brate had a 15-yard TD catch versus Atlanta, but that was his only target of the game. He’s hard to trust as anything more than a bye-week filler with O.J. Howard now back from his injury.